Oracle bone script (甲骨文) was the form of Chinese characters used on oracle bones—animal bones or turtle plastrons used in pyromantic divination—in the late 2nd millennium BCE, and is the earliest known form of Chinese writing. As the majority of oracle bones bearing writing date from the late Shang dynasty, oracle bone script essentially refers to a Shang script. It is known that the Shang people also wrote with brush and ink, as brush-written graphs have been found on a small number of pottery, shell and bone, and jade and other stone items, and there is evidence that they also wrote on bamboo (or wooden) books just like those found from the late Zhou to Hàn periods, because the graphs for a writing brush and bamboo book are present in the oracle bone script. 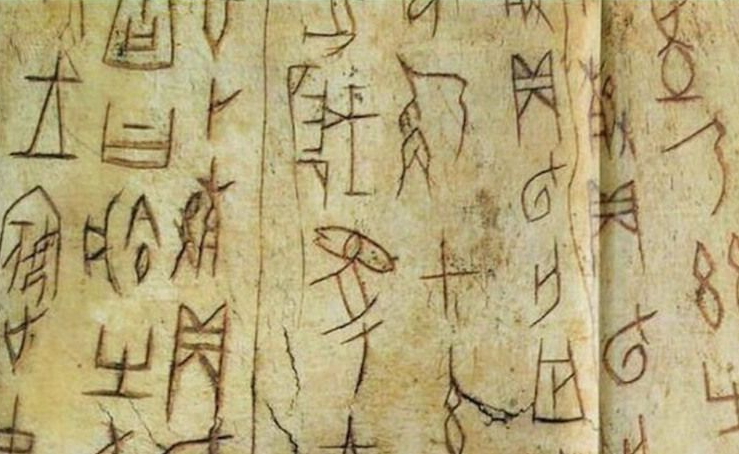 Despite the pictorial nature of the oracle bone script, it was a fully functional and mature writing system by the time of the Shang dynasty. 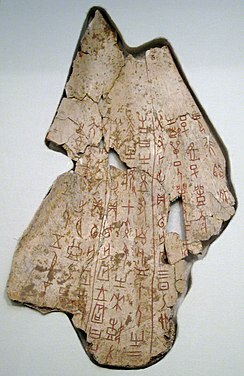 The late Shang oracle bone writings, along with a few contemporary characters in a different style cast in bronzes, constitute the earliest significant corpus of Chinese writing, which is essential for the study of Chinese etymology, as Shang writing is directly ancestral to the modern Chinese script. 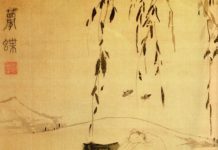 It is certain that Shang-lineage writing underwent a period of development before the Anyang oracle bone script because of its mature nature. 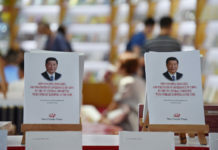 By the late Shang oracle bone script, the graphs had already evolved into a variety of mostly non-pictographic functions, including all the major types of Chinese characters now in use. Although it was a fully functional writing system, the oracle bone script was not fully standardized. 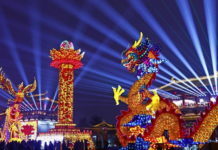 By the early Western Zhou period, these traits had vanished, but in both periods, the script was not highly regular or standardized; variant forms of graphs abound, and the size and orientation of graphs is also irregular. The more detailed and more pictorial style of the bronze graphs is thus thought to be more representative of typical Shang writing (as would have normally occurred on bamboo books) than the oracle bone script forms, and this typical style continued to evolve into the Zhou period writing and then into the seal script of the Qin in the late Zhou period.